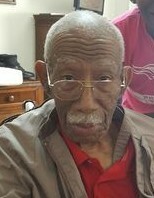 Mr. Alloway McAllister, 87 of 56 Jermon Dr. Red Springs, North Carolina transitioned from Labor to Reward on Saturday, March 24, 2018 at the Pettigrew Rehabilitation Center in Durham, NC. He was born to the late Charlie McAllister and Bertha Stewart McAllister on September 20, 1930 in Scotland County, North Carolina. Viewing at the LE Floyd Funeral Home Chapel on Friday, March 30, 2018 from 2pm-6pm and the Homegoing Celebration will be on Saturday, March 31, 2018 at 2pm at Rhyme Memorial United Methodist Church located at 623 W. 4th Ave Red Springs, NC with Rev. Dora R. Dorsey, Officiating. Burial will follow immediately after the service at the Community Rest Cemetery also in Red Springs, NC.